This is a continuation of a previous blog that discusses both ways to have a great time in Copenhagen as well as connecting to the Danish people. While at the end of the day in a city as beautiful and fun as Copenhagen there is no way to totally go wrong you may still not maximize the fun you could have. Danes are an open bunch, the most so in my personal travels, and they will surprise you how quickly they will take you under their wing and invite you out with them if you are in the right places. Nyhavn is a picturesque spot, a post card really (and it is on many), that show cases a Copenhagen from yesteryear with sailing boats and multi coloured buildings. 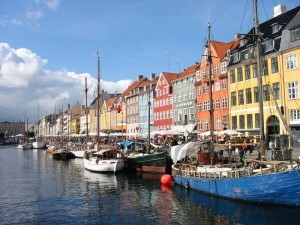 Go to a get a pint in one of the bars in Nyhavn and you will be paying $10 – 15 US dollars for it. A tip if you hang around here, when Danish people visit Nyhavn they go to the supermarket and buy their own beers and sit on nearby benches instead of the expensive terraces. Getting back to the point, when night time arrives there are loads of fun options – that real Danes, often of the younger and more artistic variety will be doing – in Noroborro. This section of town is thriving at night with a youthful energy and cheaper pubs, food, and clubs. If you are looking for fun check out the Stengade – a music venue run completely by volunteers, Drone – a fun stylish bar that’s a friendly hipster’s paradise, or Rust – a lively night club with various floors playing live music or DJs. Copenhagen, along with Amsterdam are the quintessential bike cities of Europe. From the moment that you leave Copenhagen central station you senses will be flooded with bikes going by in every which direction. Now each city is graced with activities that will really connect you to the place and in Copenhagen riding a bike is one such thing. Try it yourself, there are different places that you can rent a bike around the city. You’ll find that with a bike, a map, and a day or two of experience in the city you will have very little need of public transport. A bicycle will connect you all the way to the beaches of Amager all the way up to bohemian Norrebro.